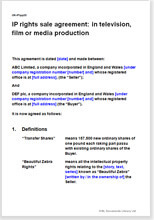 This is an agreement for a buyer and seller of rights in any audio-visual creative work. Neither party is preferred. The work could be a film, a television production, an advertising production. We assume the buyer requires full control so that he can brand and market it as his own, so the deal is a sale and not a licence. Payment is part cash and part shares in the buyer company. Edit for a straight cash deal. You may be an individual or represent a company. This agreement does not “prefer one party over the other, so you could be either a buyer or the creator and seller of an audio visual work of some kind. It could be of any size, complexity and for any purpose. For example, sale of rights in television programme or series. It could be a plain script, a book to be converted to script, or a programme consisting in a “reality” procedure rather than a written drama. Only you can describe it accurately. The creator wants to sell all rights to a production company or commercial user. We have temporarily named your book or programme “Beautiful Zebra”. Unusually, this is a document which may be bought by either seller or buyer of the rights. It covers protection for both in reasonable balance. But of course, you may edit out any provision you think may overly favour your counter party. If your transaction is for cash alone, you can very easily edit the document to delete the reference to shares. It is assumed that your deal will be set up by this agreement as a precise and firm arrangement. However, it could be completed at a specified later date, by when the buyer will have completed arrangements for authorisation of the deal. preserves moral rights for recognition of authorship.